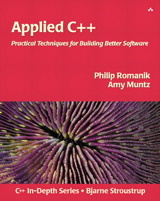 This book takes C++ a step further from the books that describe specific features of C++. It provides concrete techniques and methods for delivering commercial-quality software; software that must be portable across many platforms, meet performance goals, and be maintainable and understandable both to customers and internal developers alike. The authors include a simple image processing system to demonstrate the techniques of developing robust C++ software; it's a really fun and interesting system for programmers and developers. After reading the book, you will have an image processing framework that is useful for manipulating digital images and a practical toolkit of C++ utilities. This book is unique because it is about software development, not just programming. Sections like Reusable Code and Portability will get the reader thinking about more than trying to come up with the fastest way to code the solution to a problem. Jasmin Blanchette, Trolltech's documentation manager and a senior developer, has worked at Trolltech since 2001. He is editor of Qt Quarterly, Trolltech's technical newsletter, and coauthored C++ GUI Programming with Qt 3. Mark Summerfield works as an independent trainer and consultant specializing in C++, Qt, and Python. He was Trolltech's documentation manager for almost three years and coauthored C++ GUI Programming with Qt 3.